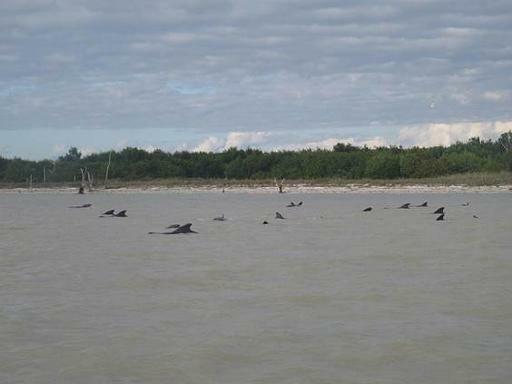 Miami (AFP) – Thirty-five pilot whales stranded in a remote part of Florida’s Everglades National Park headed toward deeper waters, raising hopes that they could be saved. Eleven whales have died since the mass stranding was first reported Tuesday after an additional carcass was found. Four of them had to be euthanized. Another six that went missing overnight Wednesday are feared dead and their bodies may have sunk to the bottom of the ocean floor. It remains unclear why they strayed into water less than three feet (0.9 meters) deep, in the southern part of the Sunshine State. “Today we are hopefully more optimistic after a Coast Guard helicopter spotted 35 of the… surviving whales swimming in three separate pods near Plover Key in 18 feet of water this morning,” Everglades National Park spokeswoman Mary Plumb told AFP. A rescue team of experts from several agencies, including the National Park Service and the US Coast Guard, grew from 25 to 35 scientists and stranding specialists who can only reach the whales by boat. But NOAA stressed that the rescuers were treading cautiously as sharks have been seen feeding on the dead whales’ carcasses. “The rescue team positioned 15 boats to help guide the whales to deeper water, which was a distance of 10 to 15 miles (16 to 24 kilometers), and the whales have been moving in the right direction,” NOAA Fisheries said. By 2:30 pm (1930 GMT), the whales were six miles offshore and swimming in about 18 feet (5.5 meters) of water. Experts and animal welfare organizations have speculated about why the whales swam to these warm, shallow waters, suggesting possible disorientation after a maritime explosion or a disorder caused by environmental pollution that leads to suicide. “The possibles causes of this situation are still unknown for us. Marine biologists said that is hard to know why they behave like that,” Plumb said.